Soda Bread is an Irish bread. Delicious smothered in real butter. Perfect accompaniment for meat stews to soak up all the lovely gravy off your plate. Yum. The recipe below is adapted by a Tesco recipe. Preheat the oven to Gas Mark 6/200°C/Fan 180°C. Tip the flours, baking soda and salt into a large bowl. Then use your fingertips to rub the butter into the flour until evenly dispersed. Make a well in the centre of the flour and stir in the buttermilk until you get a soft dough. Turn out onto a lightly floured surface and lightly knead for 1 min until smooth, then bring together to form a flattened round about 5cm thick and 15cm across. Place on a lightly dusted baking sheet. Dust with a little plain flour if you like. Use a large sharp knife to cut 2 slashes across the bread to make an ‘x’. Bake in the oven for 35 – 40mins until well-risen and browned. Place on a wire rack and leave to cool. To make the base, mix the salt and yeast together in a jug with the warm water. Place flour in a large mixing bowl, make a well in the centre and pour in the water mixture. Also add the olive oil. Use a wooden spoon to mix everything to create a wet dough. Sprinkle some flour on a flat clean surface and knead the dough for 5 minutes. Place in a bowel and cover with tea towel. Leave at room temperature to enable the yeast to do its work. After half an hour, the dough should have doubled in size. Flatten the dough into a circle, as the pizza base. Using a spatula, spread the tomato puree all over the base. Place the chopped tomatoes on top. Then add onion and garlic, spread them. Sprinkle over the roughly grated cheese and arrange Pepperoni, put as many as you like. Season with a little salt and a good grinding of black pepper. Sprinkle in the dried basil. Place the pizza on a lightly greased baking sheet..
Cook at 200° for 20 minutes. Dissolve yeast in water and 1/4 cup sugar. Stir to dissolve and let stand for 5-10 minutes. Set aside. In a large bowl, combine the milk, 1/4 cup sugar, butter, egg yolks and salt. Preheat oven to 350 degrees F. Bake for 15 minutes. Remove from oven. Combine melted butter and sugar. Brush all the ensaymada with butter sugar mixture. Flatbreads such as naan is necessary for a truly enjoyable feast of Indian cuisine. Below is a very authentic recipe of flatbread courtesy of Aiyaz, who said that this method of preparation is not dissimilar to Paul Hollywood’s (a renown tv chef) recipe. Place the four into a mixing bowl, then the yeast on one side of the bowl and salt on the other side (this prevents the salt from killing the yeast). Add the oil to the mix and start adding the water bit by bit while mixing (with a spoon or your hand) to produce a dough. If you add too much moisture, you can always add a bit more flour. Once you’ve got a dough like consistency, place it on a lightly oiled surface. Knead the dough for 10 mins, until the dough becomes less sticky and smooth. Keep oiling the surface if the dough starts to stick. Then create a smooth ball out of the dough. This is important (tip – if you use one hand, you’ve got the other free and clean to handle other objects). Lightly oil the mixing bowl, place the ball of dough into the mixing bowl and cover with cling film. Leave the bowl with the dough in a warm place to proof for about an hour – hour and a half. Take the risen dough and a knock back on a lightly oiled surface for about 5 mins. Partition the dough into 8 equal size portions. Roll each portion into a circle or oval until about the width of a pound coin. Place the rolled out dough under a medium to hot grill (leave about 10-15 cm between the dough and heat source as it will rise quite high). Keep an eye on it as cooking time is very quick. Each side may take about 3-5 mins. When fully cooked, the hot air will rise inside and the flat bread should puff up. Serve when all are cooked. Try adding cumin, coriander or other spices to the mix for different flavours. Try adding yoghurt in place of some of the water and oil for a richer flat bread. Try putting garlic butter on the rolled dough before cooking for garlic flat bread. As I’ve said, I’ve tweaked this recipe every time I’ve made it, depending on what I’m serving it with. Set aside half of the flour and reserve for shaping the chapattis. Place the remaining flour in a deep bowl. Gradually add the cold water to the flour, kneading as you go, until you have a soft, elastic dough. Flex those muscles as the more you knead the dough, the softer it will get. Sprinkle a little of the reserved flour onto a flat surface. Divide the dough into eight and shape each piece into a ball. Flatten the balls slightly between your palms, then place one onto the floured board. Use the rolling pin to flatten the dough into a disc. Add more flour to the board to prevent the dough from sticking. Heat a griddle or a frying pan. Lay the chapatti on the griddle or pan and cook for about 20-30 seconds or until the surface is bubbling. Turn it over with tongs and cook the other side for 10-15 seconds. 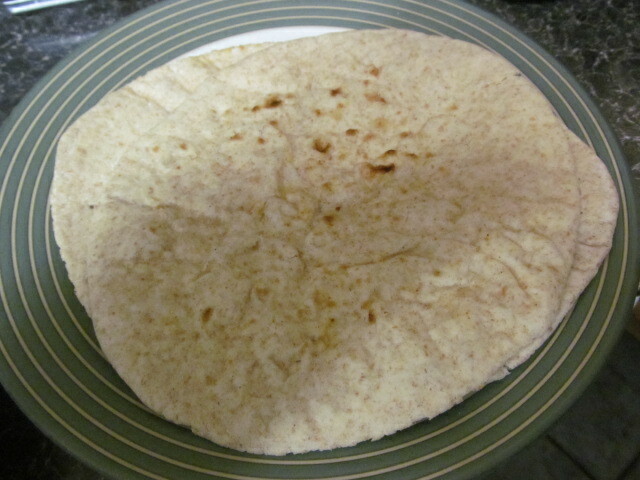 As soon as brown spots appear on the underside, the chapatti is done. Repeat with the other seven balls, using the remaining flour to roll them out. Stack them up as they are cooked, placing a sheet of kitchen towel between each one to absorb any moisture. Spread butter over one side, if you like.